Choosing large area rugs for your home can be tricky. In this post, you’ll learn how to tell what size area rug you need for your room. You’ll also learn how to choose a large area rug in the colors and patterns that will that complement your room’s decor! 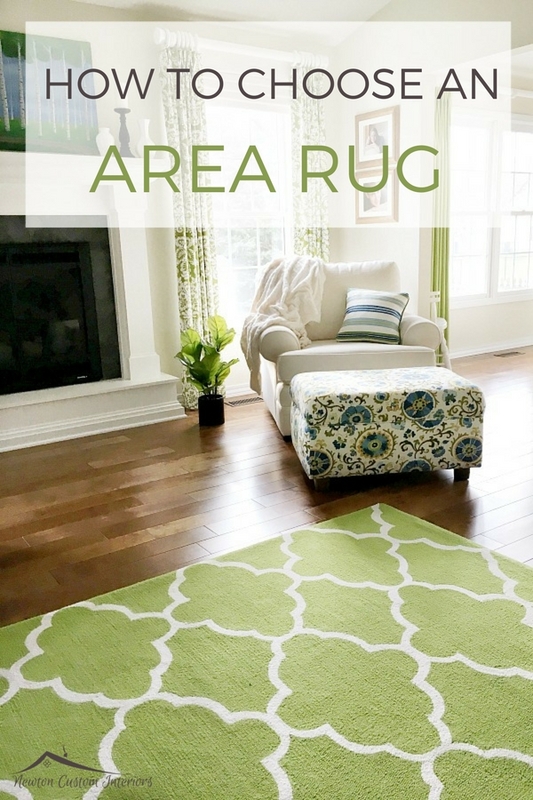 I had a question from a reader the other day about how to choose large area rugs, and I thought I would give some tips for choosing an area rug to go with the rest of your decor. 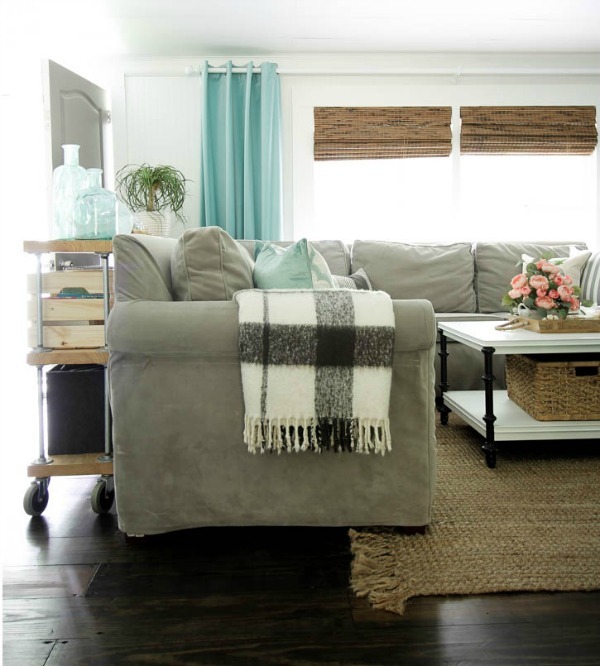 Think of the area rug as another fabric in the room. You want your new rug to coordinate with the fabrics and upholstered pieces that you already have in the room. So, keep in mind the colors and patterns you already have. I created a video a few years ago about how to mix and match fabrics if you’re stumped about how to know if the area rug goes with your other fabrics. You can find the video here. 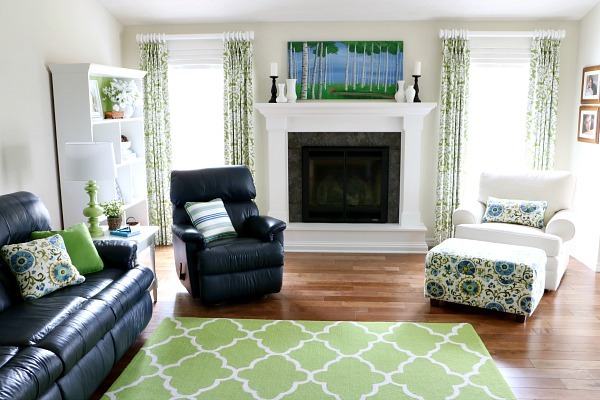 I chose a green and white area rug that coordinates with the fabrics in the room. 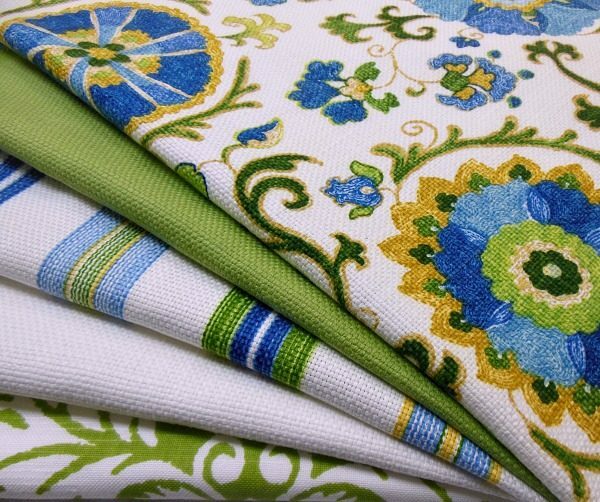 The green is the same intensity of color as the bright green in the ottoman fabric. The pattern of the area rug is a large geometric, which works with the other fabrics. Decide if you want your area rug to blend in or contrast with the floor. I wanted our area rug to be one of the focal points of our living room, so I chose the bright green and white rug that contrasts with the wood floor. Another option is to choose an area rug that blends in with the floor. In this picture, the area rug is a jute and blends with the wood floor. I love how the color of the rug is picked up in the the baskets and the shades on the windows. Choose an area rug that is the right size for your room. Most area rugs come in several sizes, so it’s important to choose an area rug that will fit in your room. You don’t want it to be too large or too small. 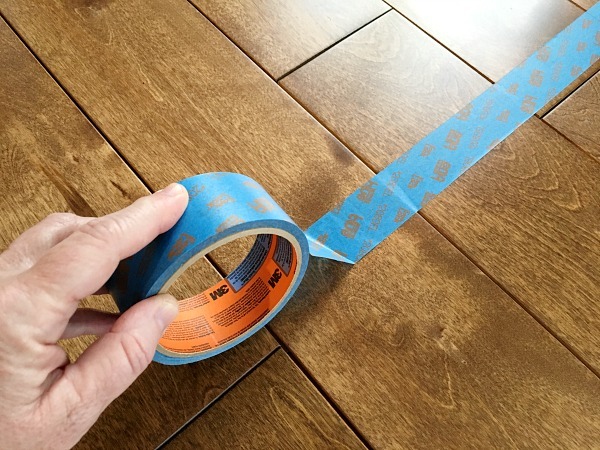 To figure out what is the best size rug to choose, use blue painter’s tape and tape the area of the rug size onto the floor. This tip helped me decide what was the best size for our living room. 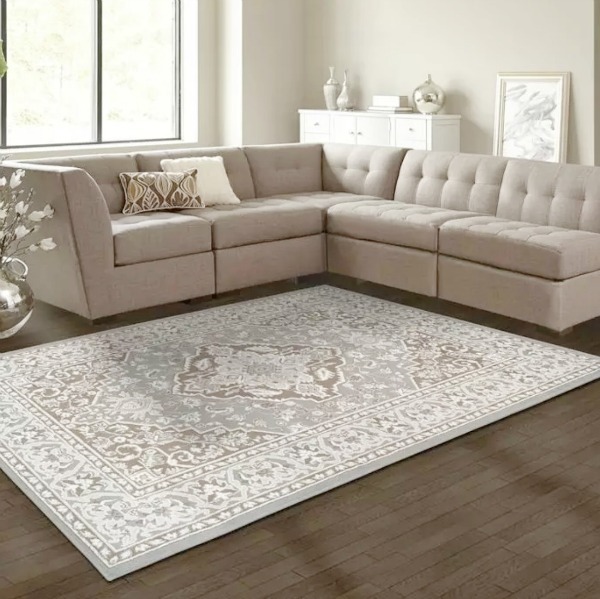 Decide if you want to buy the area rug on-line or in a store. I looked at area rugs in some local stores, but I didn’t have much luck finding what I wanted. So, I ordered our green and white rug on-line. If you order your rug on-line, please be aware that the color of the rug on your phone screen or computer could be slightly different from the actual color of the rug. I knew this going in, and was prepared to send my rug back if it wasn’t the right color. Luckily it was exactly the color that I wanted! I wouldn’t let this deter you from ordering on-line. You’ll have a much bigger selection of rugs to choose from, so that’s a big plus! 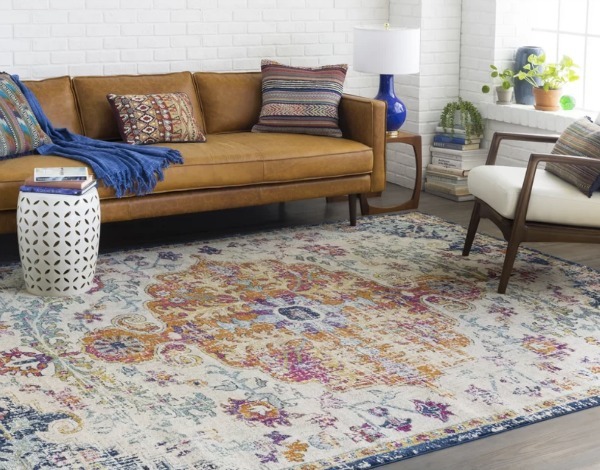 Wayfair.com – Wayfair has a wide selection of area rugs to choose from. 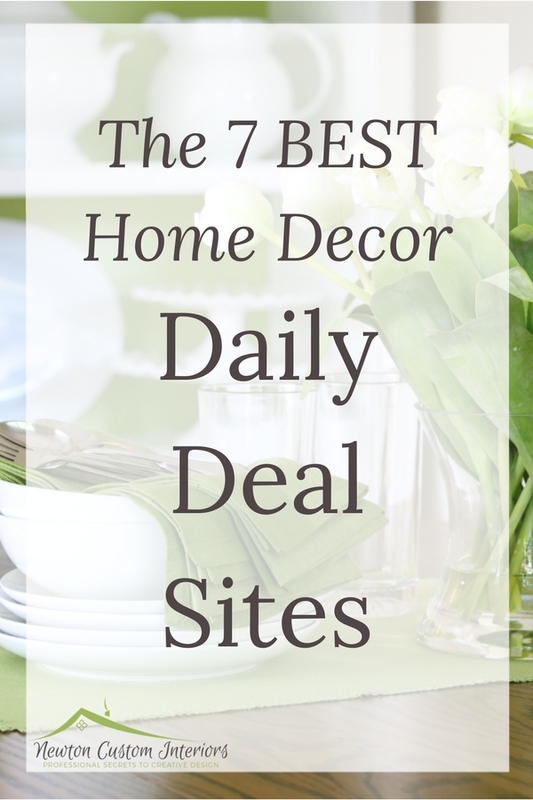 Many are reasonably priced, and they often have great area rug sales. Rugs USA – Another great option for ordering area rugs on-line. They have a huge selection, and great sales! I hope this post about choosing large area rugs was helpful! « Selling Chalk Couture – How To Get Started! Your post came at the perfect time. I’m thinking of adding a rug in my living room and/.or master bedroom. Thank you. Patty, I’m so glad this post about area rugs was helpful! Good luck in your search!